To state that St Stephen’s was opened in 1851 to serve mainly the upper part of Montpelier Road, is to over-simplify the history of an altogether older and more interesting building. It started as the ballroom of the Castle Hotel, west of the Royal Pavilion (the present-day Castle Square recalls it). 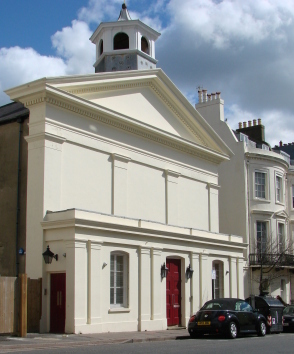 J Crunden (Dale p103) designed it and it was a main place of entertainment in C18 Brighton. Dale offers the date 1755-56 and Shipley 1767 (p20), but Colvin’s choice of c1776 is preferable to both, both stylistically (the influence of Robert Adam) and as Crunden was only born about 1741. By the early C19 the hotel was out of fashion and the Prince Regent acquired it to improve the surroundings of the Pavilion. Only the ballroom was kept and fitted up as a private chapel, with galleries on three sides and a royal pew at the ‘west’ (actually north) end. Though the Chapel Royal was almost opposite, George IV and his successors preferred to worship in seclusion and used it little. A W Pugin unkindly paired it in his Contrasts with St George’s, Windsor, though he misleadingly labels his engraving ‘Chapel Royal’. When in 1850 the town acquired the Pavilion, the Bishop demanded the chapel, claiming it was consecrated and thus belonged to the Church. His claim was upheld (for details see Dale p105), but it was of little use where it stood. H M Wagner’s sister Mary Anne gave a new site on which to rebuild it and some money, though it is odd that in 1850 a classical building was dismantled and moved, even with changes, for resumed use as a church. No architect is known, if indeed there was one designated, but the builders were Cheesman and Co (www.johnh.co.uk/cheesmanbuilder.htm) and possibly one or other G Cheesman did any necessary surveying and re-design work. On its new site, still oriented from north to south, only the stuccoed main façade is readily visible, though it is doubtful whether the original chapel had one at all. The upper part has pilasters, an over-sized triangular pediment and a small polygonal open belfry, but a west window is lacking. This may be because the original ballroom was not free-standing. The only west windows, separated by smaller double pilasters, are in the porch, which extends across the whole front. Inside, there were galleries at the narrow north and south ends and there is an altar-recess on the middle of the east side. This appears to have been an alteration of 1851, when the chapel was moved, for Pugin’s engraving shows the service being taken at the narrow southern end. Crunden’s frieze of Grecian urns and ornamented pilasters was re-used beneath a plain coved ceiling. The church led a precarious existence and did not have a designated district until 1908. Plans to rebuild never materialised, though in 1891 Sir A W Blomfield renovated the interior (CDK 1891 pt 2 p153), removing two pulpits either side of the altar-recess. After its status was regularised, Sir W Tapper redecorated it in 1909 (CDG Sept 1909 p149) to meet the requirements of the Ecclesiastical Commissioners. It then continued unchanged until regular parochial worship ceased in 1939. After that until about 1970 it was used as a centre for the deaf and subsequently became a refuge for the homeless, for which the interior was subdivided. Following a fire in 1988, the building was restored and there were further renovations in 2010-11 by Camillin Denny (BE(E) p169). They renovated and repainted Crunden’s surviving plasterwork and by placing the services needed for its present purposes in removable ‘pods’ have managed to retain much of the original atmosphere of the church. Externally the main facade is in good repair, though the side elevations retain the original and now rather shabby cement-render and look little altered.